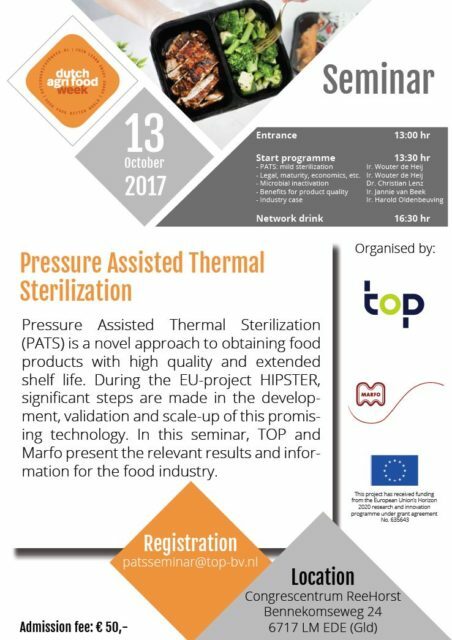 On Friday the 13th of October, TOP and Marfo organize a seminar. The seminar will be about an innovative mild conservation technique: Pressure Assisted Thermal Sterilization (PATS), also known as High Pressure Thermal Sterilization (HPTS). Recently this technology made a new step towards practical application. We’d like to share our latest knowledge gained in the EU-project “HIPSTER”. During the seminar Marfo and TOP will let you discover the technology, focusing mainly on the industrial relevancy and benefits. Finally you will have the possibility to taste products conserved with PATS processing. After all, that will be the only way to really demonstrate the added value of this new technology. in time (September 27th at the latest).